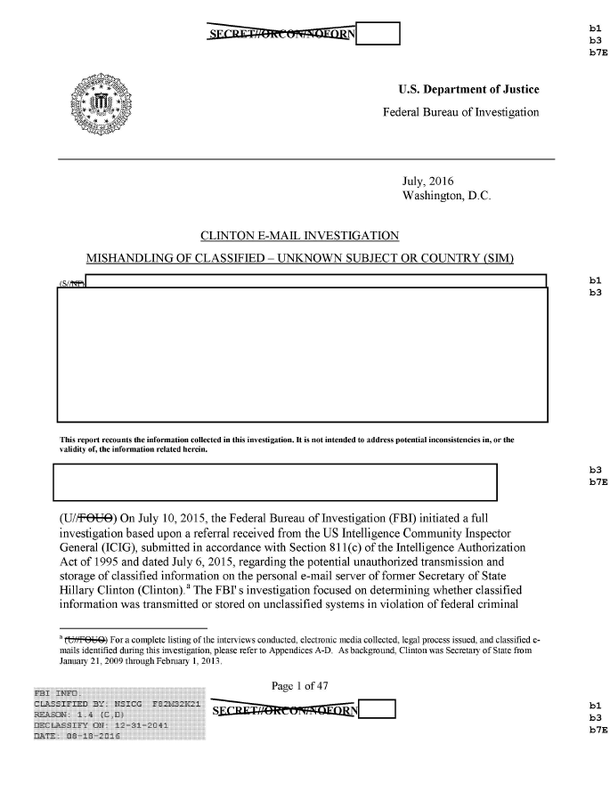 The following report and documentation related to the FBI's investigation into Hillary Clinton's personal email server was released by the FBI on September 2, 2016. On July 10, 2015, the Federal Bureau of Investigation (FBI) initiated a full investigation based upon a referral received from the US Intelligence Community Inspector General (ICIG), submitted in accordance with Section 811 (c) of the Intelligence Authorization Act of 1995 and dated July 6, 2015, regarding the potential unauthorized transmission and storage of classified information on the personal e-mail server of former Secretary of State Hillary Clinton (Clinton). The FBI’s investigation focused on determining whether classified information was transmitted or stored on unclassified systems in violation of federal criminal statutes and whether classified information was compromised by unauthorized individuals, to include foreign governments or intelligence services, via cyber intrusion or other means. The FBI’s investigation and forensic analysis did not find evidence confirming that Clinton’ s e-mail accounts or mobile devices were compromised by cyber means. However, investigative limitations, including the FBI’s inability to obtain all mobile devices and various computer components associated with Clinton’s personal e-mail systems, prevented the FBI from conclusively determining whether the classified information transmitted and stored on Clinton’s personal server systems was compromised via cyber intrusion or other means. The FBI did find that hostile foreign actors successfully gained access to the personal e-mail accounts of individuals with whom Clinton was in regular contact and, in doing so, obtained e-mails sent to or received by Clinton on her personal account. Prior to January 21, 2009, when she was sworn in as the US Secretary of State, Clinton used a personally-acquired BlackBerry device with service initially from Cingular Wireless and later AT&T Wireless, to access her e-mail accounts. Clinton initially used the e-mail addresses hr15@mycingular.blackberry.net and then changed to hr15@att.blackberry.net. According to Cooper, in January 2009, Clinton decided to stop using her hr15@att.blackberry.net e-mail address and instead began using a new private domain, clintonemail.com, to host e-mail service on the Apple Server. Clinton stated to the FBI that she directed aides, in or around January 2009, to create the clintonemail.com account, and as a matter of convenience her clintonemail.com account was moved to an e-mail system maintained by President Clinton’s aides. While Cooper could not specifically recall registering the domain, Cooper was listed as the point of contact for clintonemail.com when the domain was registered with a domain registration services company, Network Solutions, on January 13, 2009. Clinton used her att.blackberry.net e-mail account as her primary e-mail address until approximately mid-to-late January 2009 when she transitioned to her newly created hdr22@clintonemail.com account. The FBI did not recover any information indicating that Clinton sent an e-mail from her hr15@att.blackberry.net e-mail after March 18, 2009.